Kittens love to play, but when they become overexcited they often scratch and bite. This behavior is natural to kittens and is not a sign of anger (most of the time). If left unchecked, it can become a serious problem. This is especially true when your kitten's playmate is a young child. Fortunately, in most cases, it's fairly easy to tame fierce kittens and avert this behavior. Why Do Kittens Scratch and Bite? If someone other than yourself is complaining about the kitten's behavior, watch to see the interaction between that person and the kitten. Some young children are not yet able to understand that they can hurt a pet and may be inadvertently playing too roughly with the kitten. Avoid touching your kitten's paws and stomach. While some kittens are comfortable with being touched on any part of the body, others are protective of these vulnerable spots. Examine your kitten gently by petting it all over. If it consistently responds negatively to a gentle touch in a certain location, there's a good chance it's been injured. If that's the case, a trip to the vet is in order. Be sure that your kitten's behavior is not related to something that it finds frightening. For example, is it scratching only in certain rooms, with certain people, or around certain animals? If that's the case, you may wish to investigate the source of the kitten's fear. 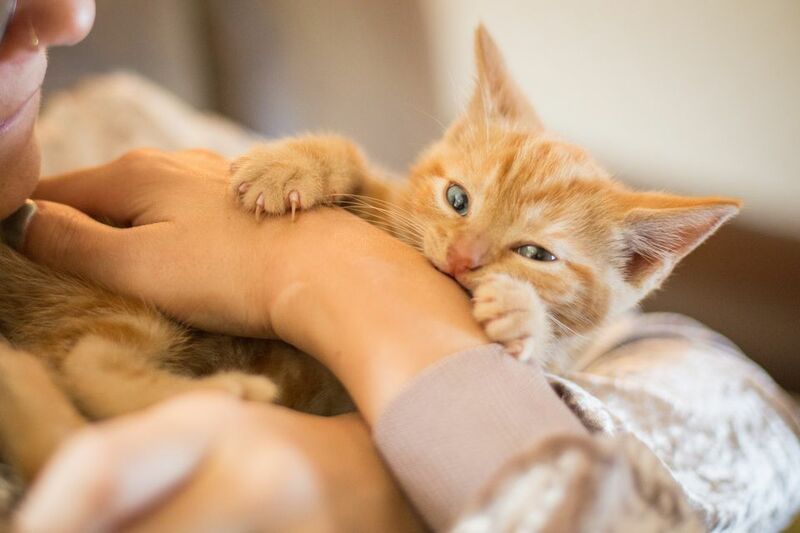 When kittens scratch and bite, it's likely that they've been encouraged to do so at some point. This is especially common if you or your children are accustomed to playing with a puppy. It is very important that you do not "roughhouse" with your kitten in the manner you might use with a dog. Playing rough with your kitten will teach the feline that hands are toys, a lesson that will be harder to break later on. Try substituting cat toys for your fingers when you're rough-housing and save your fingers for gentle petting. Make sure all family members (and visitors) are aware of these guidelines so the cat will receive a consistent message. You've checked and are sure your kitten's biting and scratching is not a sign of any physical problem, you've minimized rough-housing with your bare hands, but you're still winding up with kitten scratches and nips. Here are some tips for managing the problem and training your kitten to stop this behavior. Claw trimming, unlike declawing, does not injure your cat and should be done regularly. Do not use scissors or nail clippers designed for humans; instead, purchase a clipper designed for cats. Your vet can show you the proper length and trimming technique. Don't scream it, but say "Ouch" loudly and clearly. While you have your cat's attention, slowly remove your hand from its clutches. Don't yank it away or the kitten will think the play is on, and they will try to grab it again. Instead, gently push your hand against the cat, then pull your hand away. Give the Kitten a "Time-Out"
You can either leave the room or take your kitten to a small quiet room and leave it there with the door closed. Your feline may just be overstimulated and in need of some quiet recovery. Open the door after 15 minutes. If the kitten is asleep, which is often the case, leave it alone for a while. If they are awake, the cat may be needing some loving attention. Forget the play for now: just pet your kitten and tell him or her how loved it is. Often playful biting of hands or feet occurs simply because your cat is bored, and is looking for a play object. Give your kitten 15 minutes of active play with an interactive toy. Da Bird or other teaser toys are a great choice. Alternatively, try a laser-beam type toy that kittens can chase and pounce on, or even commercially available "gloves" with very long dangling "fingers." Once you've taught both yourself and your cat that hands are not toys, your play sessions should be more enjoyable for both of you. In addition to the active play, a scratching post (or two) are a positive addition to your home. To the kitten, these are now places where scratching is encouraged. Try both horizontal and vertical posts and ones with different textures to find the type your kitten likes best. If you and your family have remained consistent and tried these techniques and your kitten is still scratching or biting, it may be time to speak with a vet or a get the help of a feline behavior specialist. These experts can often come to your home, see how the situation is manifesting, and offer concrete tips and solutions for your specific cat, situation, and lifestyle.